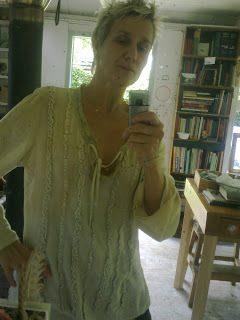 very slightly modified linen shirt; dyeing details here and here; I added a bit of 'lace' to the neckline. I'm quite pleased with the result, suits a hot day like today. I LOVE that neckline - esp. on you!! how beautiful and subtle both the colors and textures. it is best bra-less, at home of course, out in public I'll probably be wearing 'something' underneath....wow you reacted very fast btw, have you started dyeing yet?